Ably’s new API Streamer system supercharges your streaming APIs, allowing companies to swap vital business information faster, more simply, and in greater volumes than ever before. Built on Ably’s proven global Data Stream Network, API Streamer lets you deliver data to as many consumers as you need to — including to end-customers’ devices. You just pay for the capacity you use. The API Streamer is serverless meaning there’s no infrastructure investment to worry about. By publishing with an open protocol of your choice, you can focus on your data, not your tech or distribution. API Streamer puts you in control of your data, allowing you to monetize its distribution and giving you the operational tools you need to publish it efficiently — including analytics, security, billing & developer portals. Ably is committed to liberating streaming data. Platform interoperability, open protocols and standards are at the heart of everything we do. Over 200 companies trust Ably to deliver their realtime data. Ably API Streamer lets you concentrate on creating data, whilst we worry about getting it to your customers, and their users, instantly. Our platform responds to changes in demand dynamically to manage the available global capacity. This also means you only pay for what you actually use. 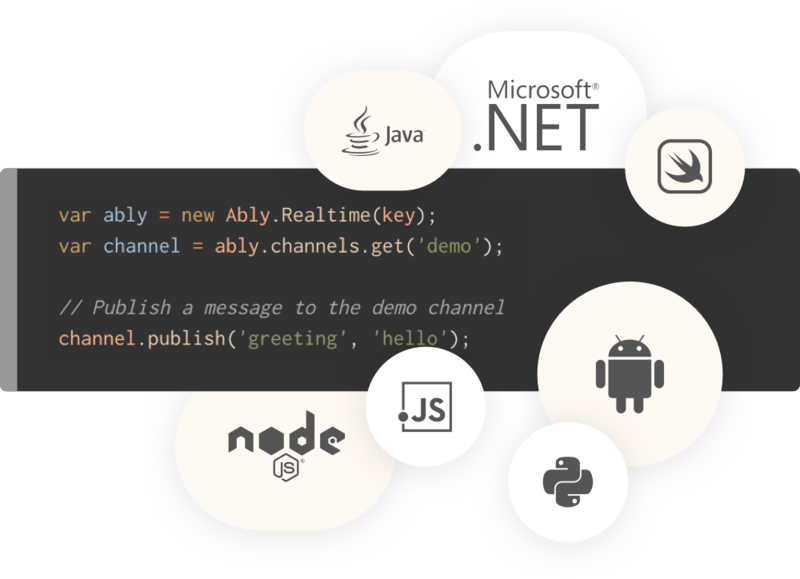 Ably API Streamer isn’t just a platform for B2B server-to-server communication. The platform can stream data direct from its source — such as an IoT device — right through to wherever it needs to go, even as far as an end-user’s mobile app. No other platform supports the complete data supply chain in this way. 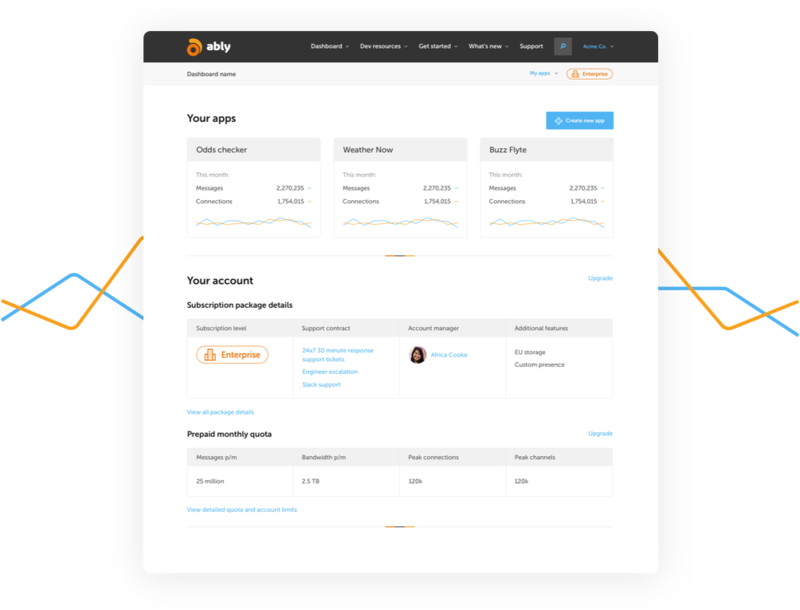 Whether you’re producing data, or consuming data, Ably offers APIs that developers love. They can work in any language and platform they want as we offer all the popular SDKs. If developers prefer open protocols, they can choose one of many protocols we support, and an encoding like JSON or binary MsgPack of their choosing. And if developers consuming data from the API Streamer want data pushed to their services, we support every popular cloud, queuing, streaming and serverless environment. Consumers may not need all the data you publish, or indeed want the data in the same format you’re publishing it. Our soon-to-be-activated transformation and filtering capabilities will let you publish custom streams for your customers with transformations and filters applied. You can even allow consumers to filter the data they need, in the formats they want, with no involvement from you. Using data deltas, we can optimize streams by up to 90%* whilst always ensuring clients have the latest versions of your data. You benefit from lower data costs and faster delivery to your customers. Our proximity to your subscribers, with 15 datacenters globally, means Ably API Streamer can guarantee class-leading performance with the lowest latency service available. We currently deliver global round-trip median latencies of less than 65ms. Naturally, we provide all the management dashboards, documentation, tutorials, and developer guides that ensure your teams can integrate swiftly and cost-effectively. Plus we offer developer portals for your customers so their teams can be up and running quickly. All backed with 24/7 live support to ensure developers can get up and running in hours, not weeks. We give you all the tools you need to manage your APIs. Your producer dashboard gives you complete control over who has access to your data products, and full analytics detailing what data is produced and distributed. You control how much is distributed and who’s paying for the data distribution and bandwidth costs. We want to keep your APIs and data safe and secure from attack. Denial of Service protection and mitigation is baked into the service. And end-to-end encryption is available in addition to numerous authentication and authorization schemes, including token based and JWT authentication with fine grained access controls. We’re utterly committed to Open Source. We support open protocols, proprietary protocols, and we’re always working to support new protocols. Whichever cloud, protocol or platform you prefer to work with, Ably API Streamer has you covered. Our customer-centric approach to availability, and proprietary client-side approach to routing, allows us to provide an industry first, our unique 100% uptime guarantee. Start publishing streaming APIs in minutes. 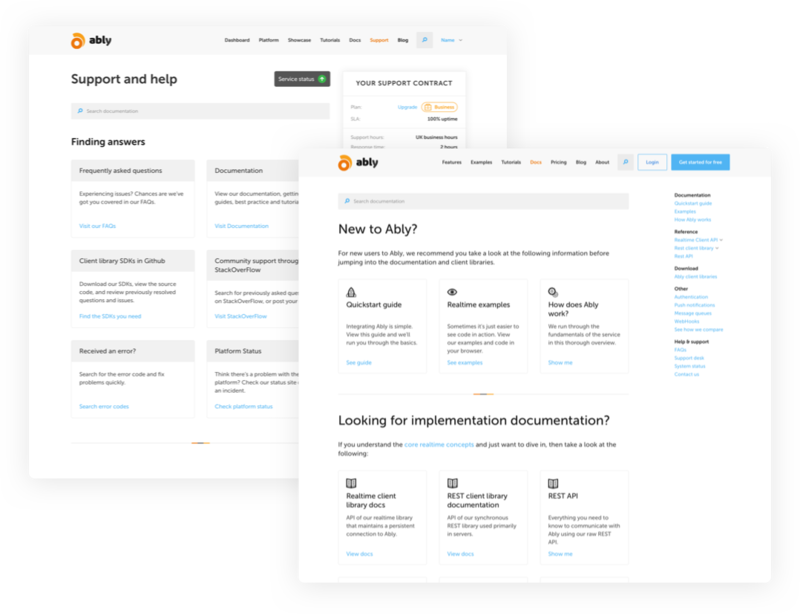 If you’ve got questions about Ably API Streamer, see our FAQs, or contact us to discuss your requirements.